Oh man, have I really not updated this since right after Dopy? Yikes, my bad! Post-Dopey, I slowly started running again, not wanting to lose too much endurance from my training. 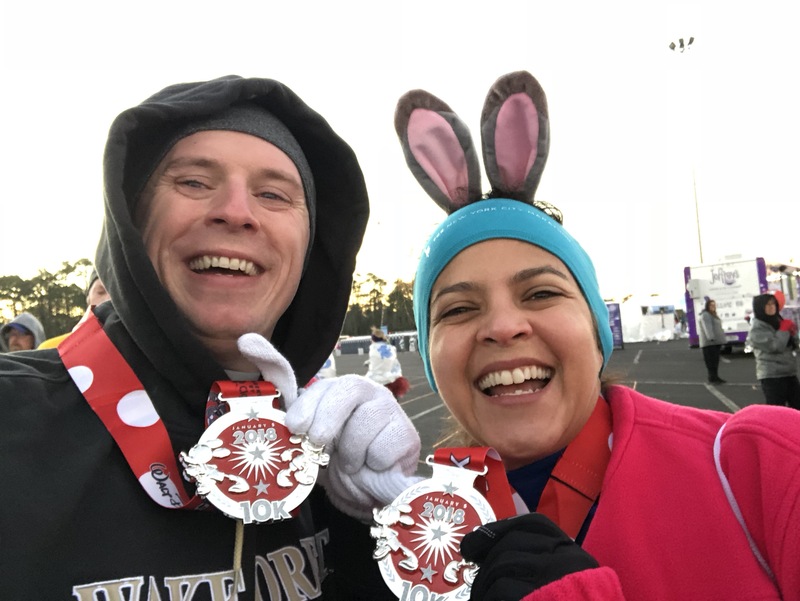 I ran a 10k in March (Winter Park 10k) where I somehow set a new PR (by 20 seconds, but still) on a pretty hilly course. I finished in 50:22. I think had I had a better starting position, or the course wasn’t as hilly, I had a shot at sub-50. Maybe next time. I honestly didn’t expect to run that well. 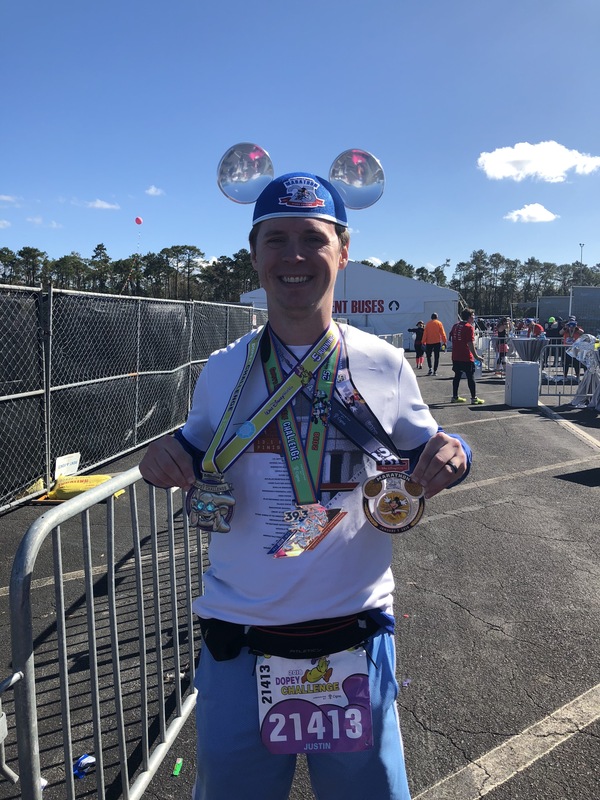 This month, I’ve done two races. First up was the IOA Corporate 5k, which is held after work in downtown Orlando. 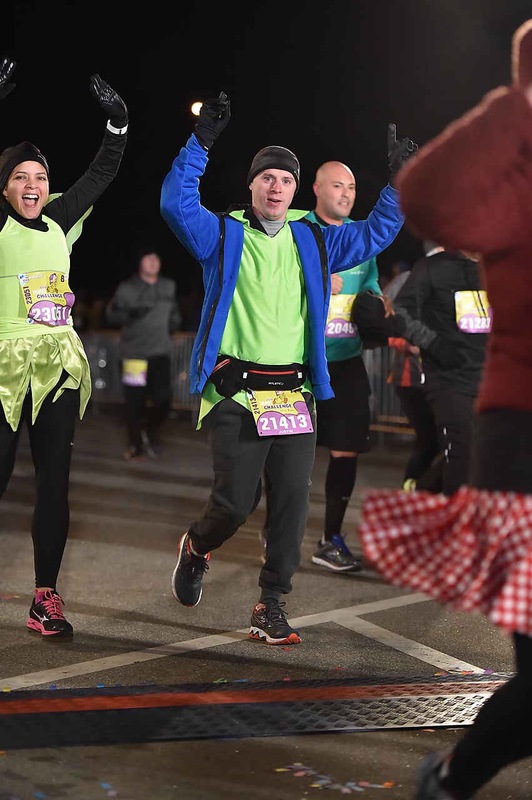 There’s so many runners, it’s basically impossible to really PR. I thought I was lined up well given the size, but I was incredibly wrong. After a ton of weaving, I finally found some open space…after 2.8 miles. Oops. I still managed a 25:02, good for my second fastest 5k ever. At least at sub-13.1 distances, I think I’ve finally found some speed. 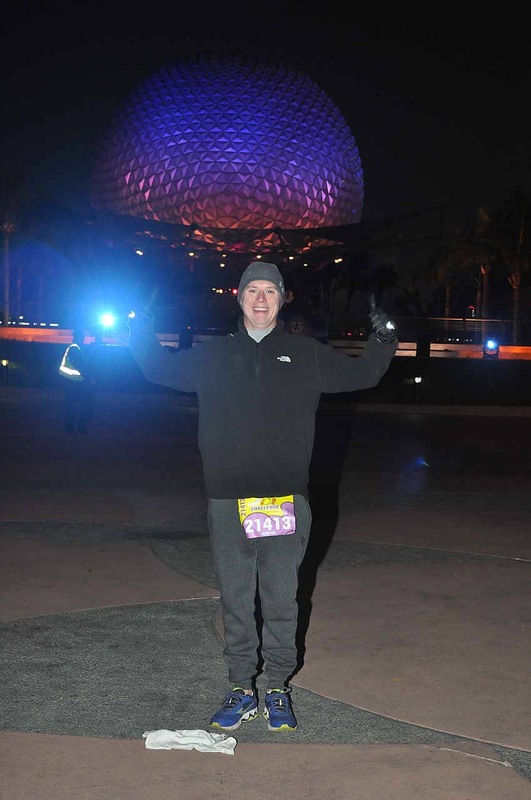 The second race is one I’ll do a formal race recap for, but it was the Star Wars Dark Side half marathon at Walt Disney World. 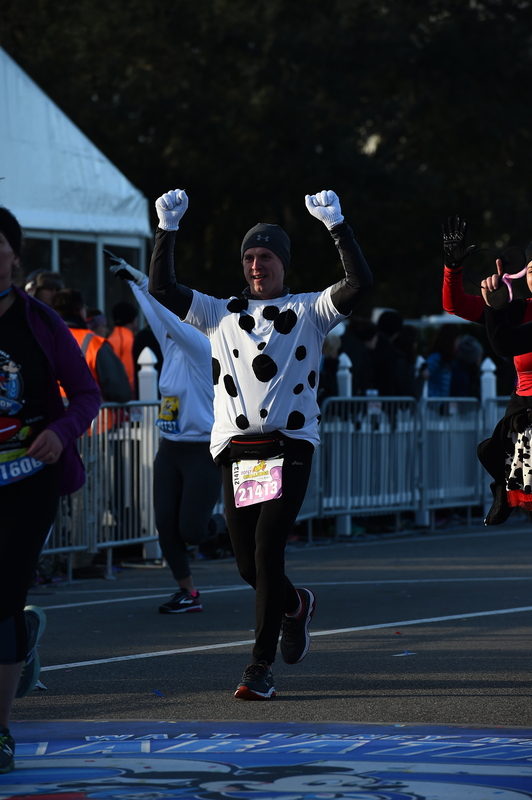 runDisney races are known for their fun atmosphere, not so much for PR attempts. I wasn’t really in shape to PR anyway, and it was very humid (they gave multiple warnings to not even try). It was still a very fun day, regardless of the weather at the start. Overall, things are going fairly well running wise. I’ve missed a few days here and there, but I’ve mostly kept up with running. I’m ahead of pace for my overall goal of 1000 miles in 2018, which is awesome. 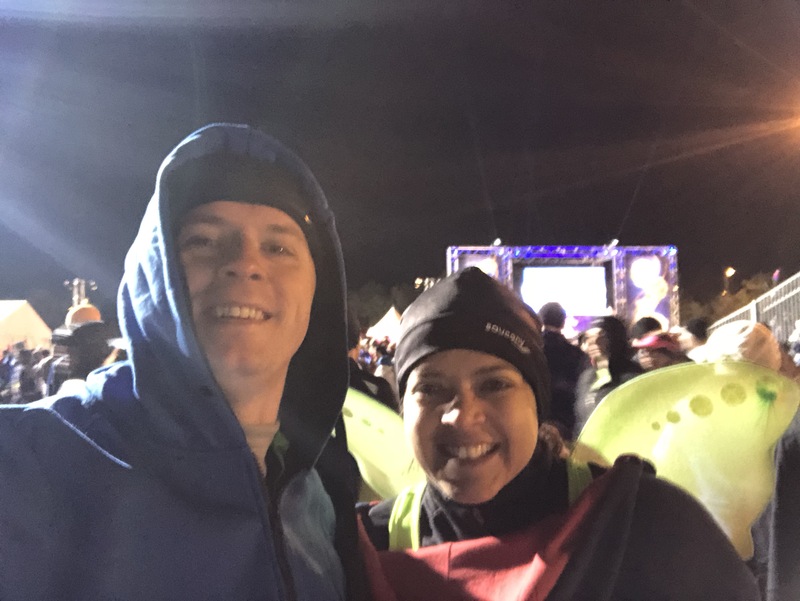 Note: If you’re just joining us, please check out my 5k and 10k recap, my half marathon recap and my full marathon recap. 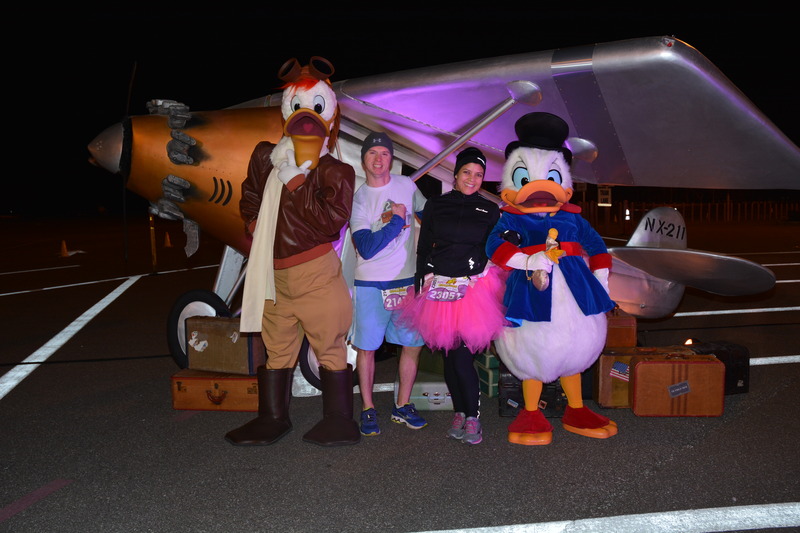 I knew I couldn’t complete my Dopey Challenge recap without talking about the character stops! It’s one of the best parts! 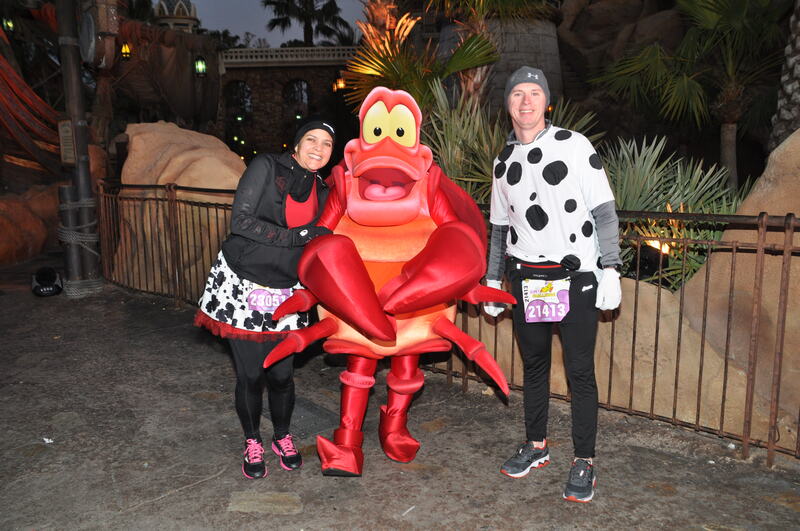 You see, throughout the races, Disney has characters out that you can take photos with. Everyone from Mickey to Genie to members of The Adventurer’s Club. 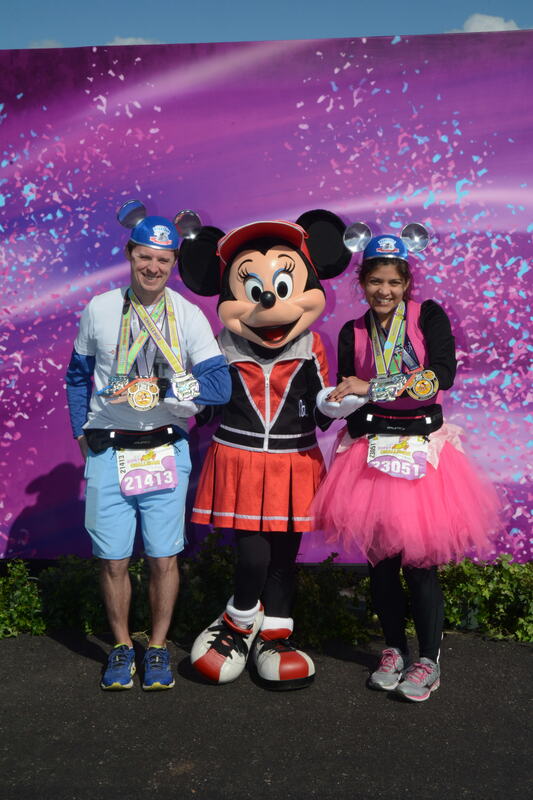 Most of the stops have Disney Photopass photographers there to take your picture with the characters, which can be tied to your bib # for easy retrieval. If you don’t have Photopass, or don’t want to pay for it, the cast members there can also take a photo with your cell phone. It’s pretty awesome. As APs, we have Photopass and had planned to take full advantage of it. It seems this is all we have between the 5k and 10k, but I know there were more. 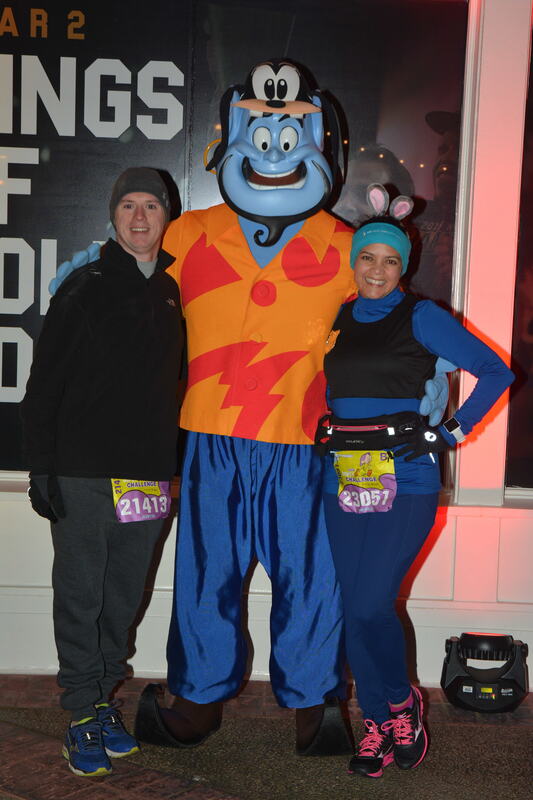 During the 5k we skipped Chip and Dale, Vacation Genie (he was actually out for all four races, in different places), and some of the guys from Move It! Shake It! 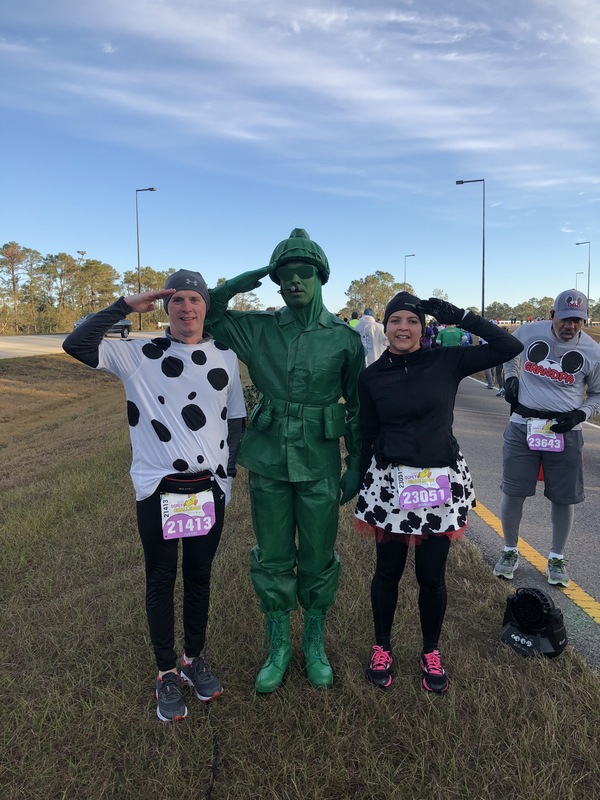 We did stop for Clara Bell the cow outside of The Land during the 5k, as well, but that picture seems to have disappeared. Ro had to stop at a port-a-pottie, and as we did, I looked over and saw Jack Sparrow. I ran across the street and got in line, and she came out right as we only had one or two people in front of us. Perfect timing! We waited in this line because Tinkerbell was there. As we were the next one’s up, Tink and another fairy left, so we missed them but got these two. Yes! One of the longest lines we waited in, outside of Jack and Sally. Another stroke of bad timing, we waited in line for Woody and Jessie, but with just a few people in front of us Woody took his break. Oh well. These guys went on break right before we got there, but we waited anyway. 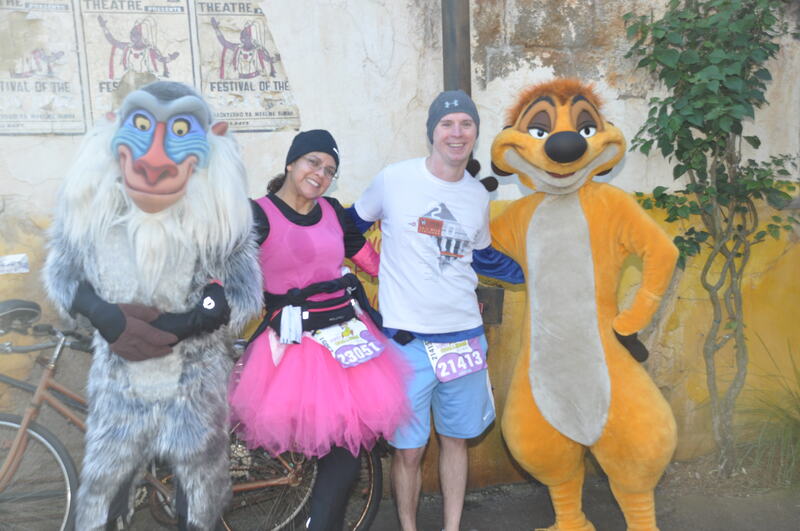 And kind of odd that it was Rafiki with Timon, and not Pumba. In the athlete’s village area, several of the big name characters were out. 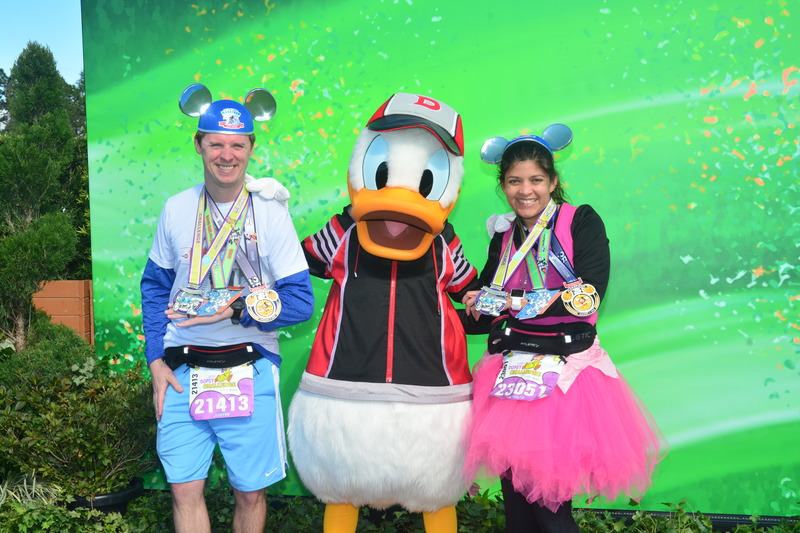 Each of them would have insanely long lines during the day of their race (aka Pluto on Thursday, Donald on Saturday, Dopey on Sunday), so we opted to take them during other days. All in all, the photos were great. We took a few with our cell phones as well, since a few of the stops didn’t have a Photopass photographer. 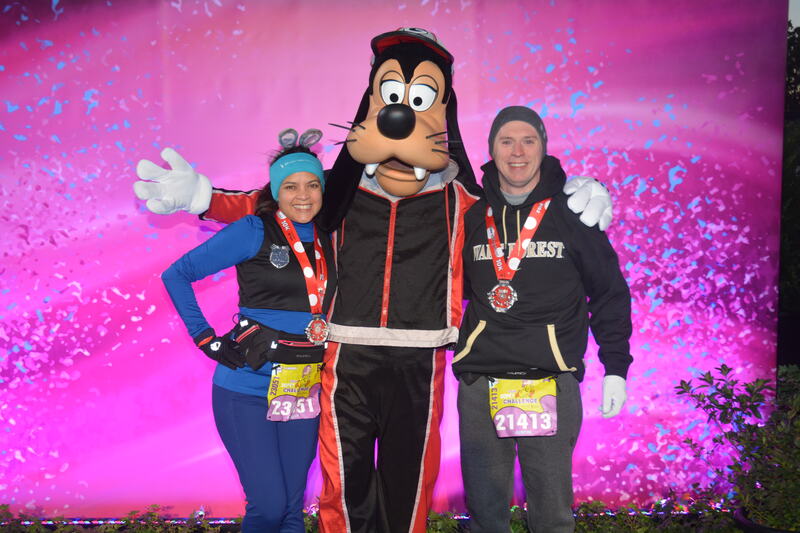 If you’re debating getting Photopass for race weekend, do it! We love it. 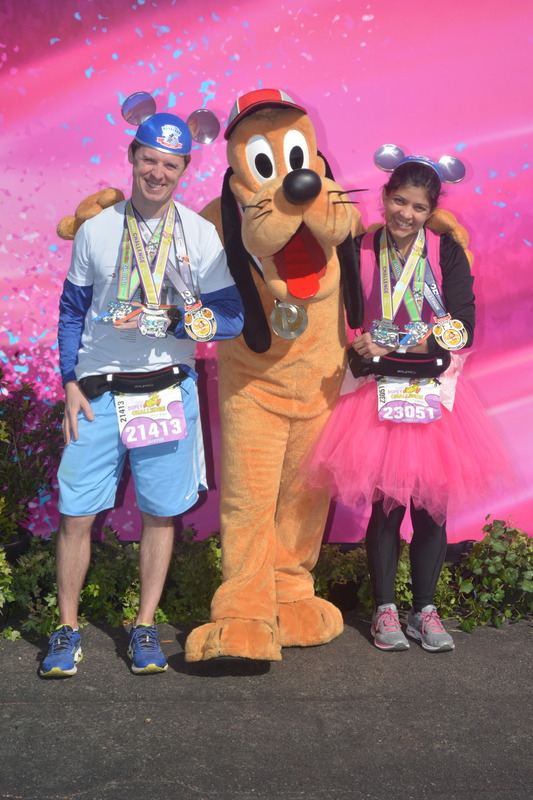 And with that, my Dopey Challenge recap is complete. It was an incredible experience. The first question we get asked is, “Are you crazy? !” The second is usually “Would you do it again?” To that I say, maybe. Not every year, that’s for sure, as it’s very expensive and takes up a great deal of time. We have the privilege of living close by so we can visit the parks often. But for many people, race weekend is also vacation weekend. Trying to manage the races, family, having fun, etc. is just too much for me. Maybe we’ll do it again for the 10th anniversary, but for now there are other races and other goals to do first. 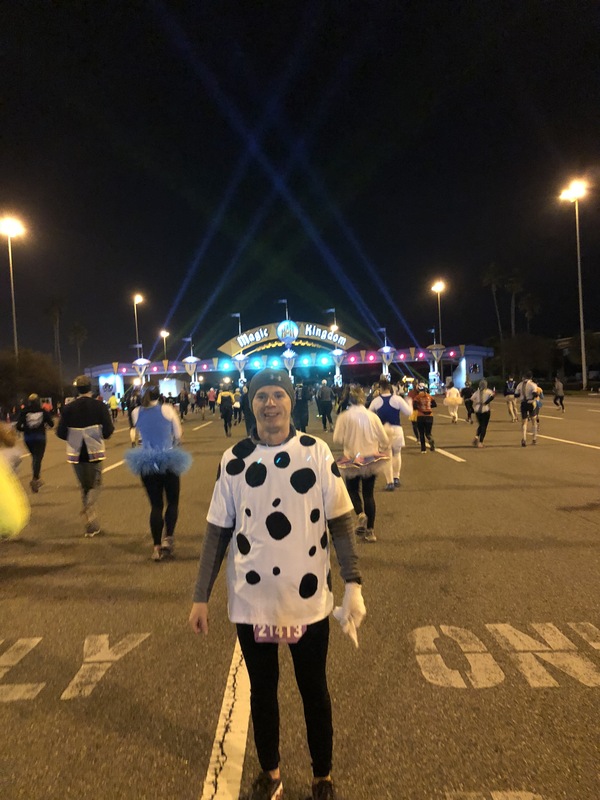 Note: If you’re just joining us, please check out my 5k and 10k recap and my half marathon recap. Day four, and another pre-3AM wake-up call. Yeah, these were getting old, but last one! Woohoo! At this point a bit of delirium was setting in. 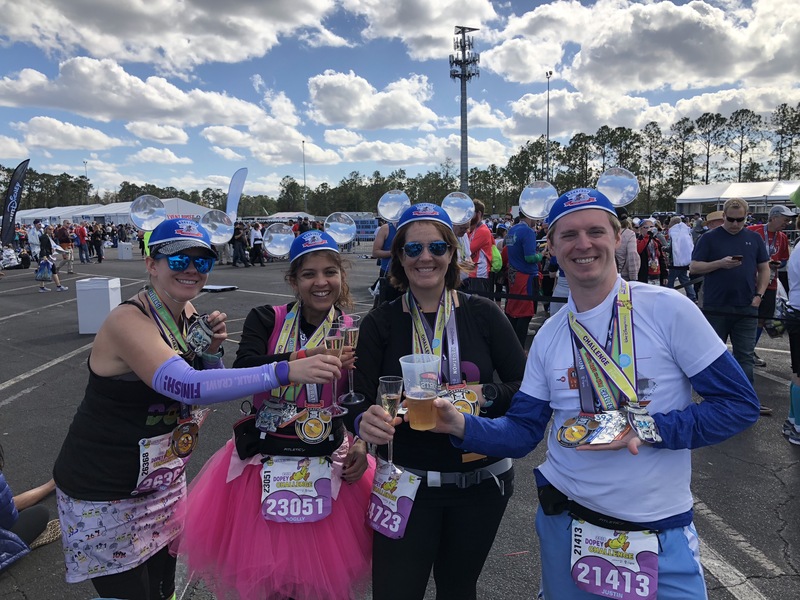 We ate our typical pre-marathon meals, dressed for multiple weather scenarios, picked up our friends and drove to Epcot. I had heard that traffic could be a nightmare, so we left a tad earlier than Saturday but made it just fine. We had a solid hour in the (warm) car before heading to the corrals. The weather would be very cold at the start (mid-30s) but would warm up into the high-50s/low-60s and sunny later on. We knew we would be out on the course for a long time, so we had to dress for both. I opted for shorts, a long-sleeve tech shirt, a short-sleeve tech shirt, hat, gloves, and a fleece throw-away top to keep me warm up in corral and for the first few miles. 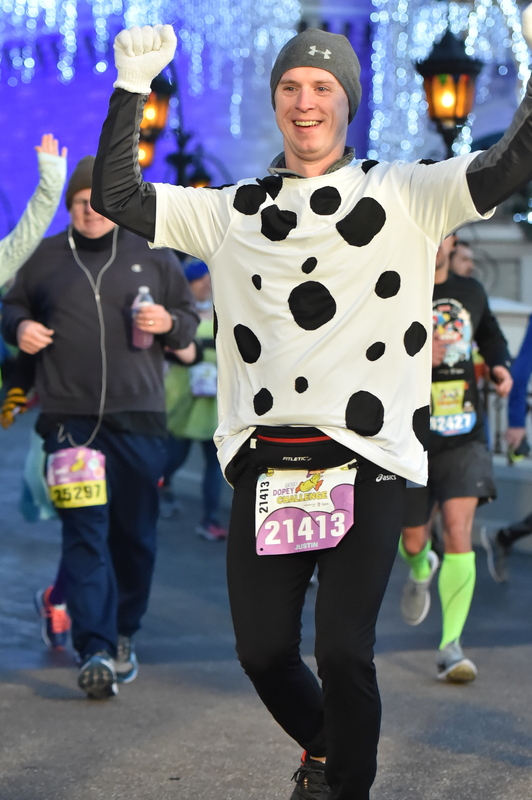 It was a solid plan, and I felt good throughout the run. The first several miles were the exact same as the half the day before. We started on the highway, ran onto World Drive, through the auto plaza into the Magic Kingdom, around the parking lots (stopping for photos with Launchpad McQuack and Scrooge McDuck!) and through the TTC, towards the Contemporary and into the Magic Kingdom itself. 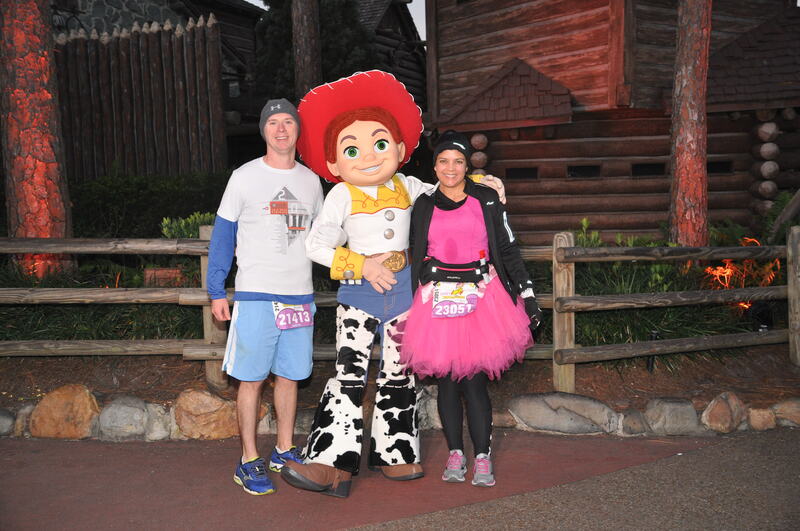 We skipped all other photo stops until we got to Woody and Jessie, and even though the line was long we decided to stop. In a story that will repeat throughout the day, right before we got to the front of the line Woody took a break, so we just got Jessie. Somewhere in the midst of taking a photo of the mile markers (which we managed to get all of them! ), I lost a glove. Not both of them, just one. It was when I was ditching my throw-away top. So there I was, one glove, and it started getting a bit chilly again. Crap. We were only a few miles in, and there was a loooong way to go. Yikes. Upon leaving MK, you head down Cone Alley by the Grand Floridian, and finally deviate from the half course. 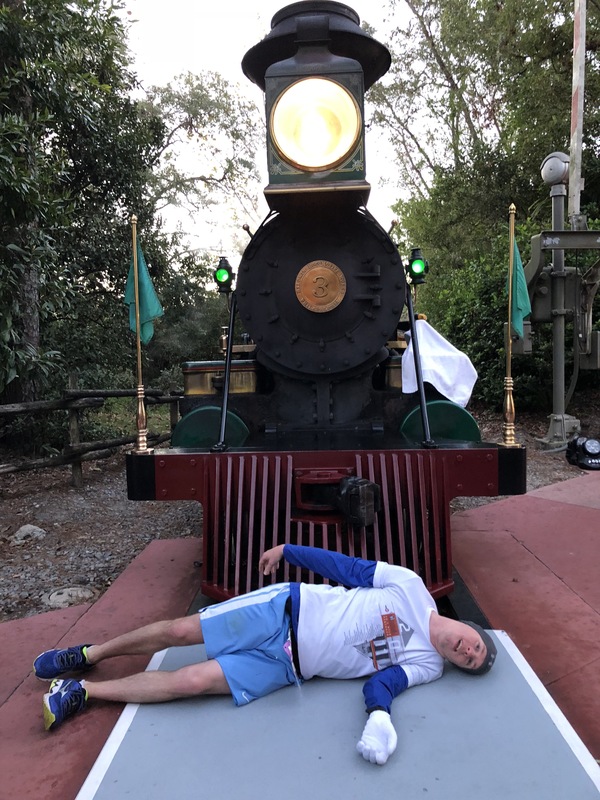 The WDW Marathon gets a well-deserved reputation for being a bit of a boring course, with a lot of long stretches on highways, lots of ramps, lots of dead space. You leave the MK at mile 6. You enter Animal Kingdom at 12.5, leave it at 14, and don’t enter another park until 23. The rest of that time is just plain, boring roads. In a repeat from our Woody/Jessie photo, we got in line for Timon and Rafiki (where’s Pumba?!) who promptly went on break. We decided to wait, and luckily it didn’t take long for them to come back, and we were back on the road. Now, the time between AK and HS is miserable. You’re on boring roads again, until you hit the Wide World of Sports. This is just round and round you go, throughout the property. Even the DJs seemed pretty miserable. You’re there for a few miles, and as soon as you get out you feel relief. 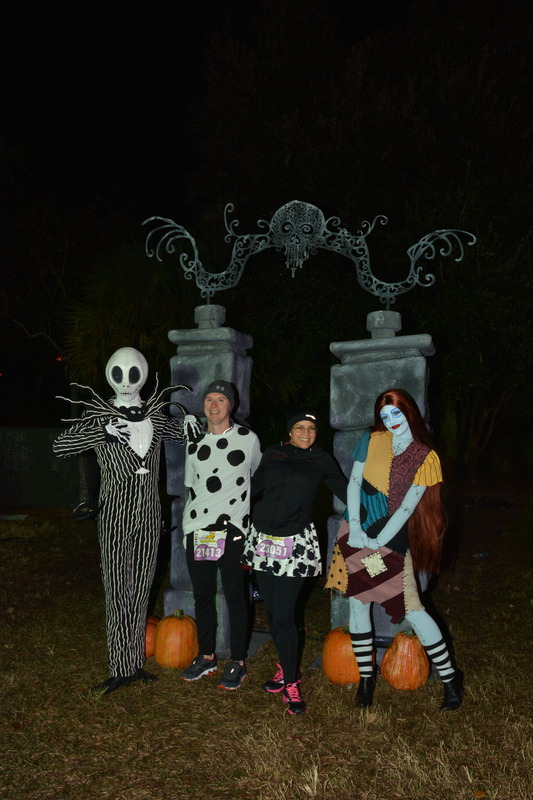 We opted against most photo stops there, since we had taken many with the characters at the start/finish village instead. Plus, I think Ro just needed to keep on moving. At this point we slowed our interval from 4/1 to 2/1. Eventually it would turn into run whenever we could. 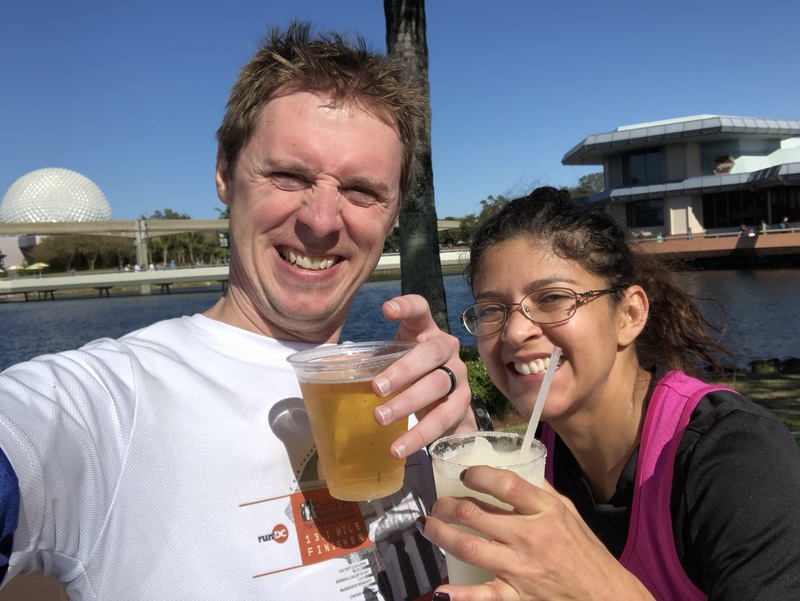 With WWOS in the rearview, we were onto the last little bit: Hollywood Studios, Boardwalk, World Showcase and margaritas and beer! Wait, what? Yup! We opted to stop at the margarita stand and get some drinks to power us through the final half mile. 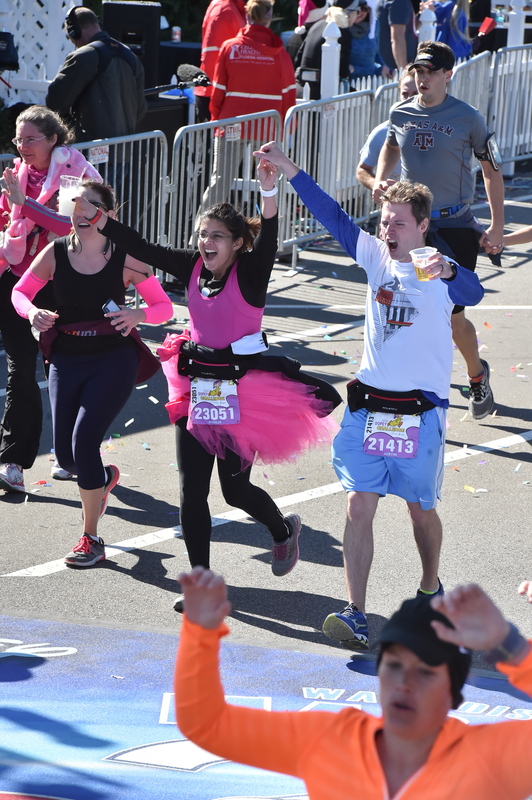 I mean, everyone knows fueling and hydrating is the most important part of a marathon, right? We stopped at mile marker 26, listening to the gospel choir, and knew we would be finishing in just a few minutes. We crossed the finish line in what was our slowest time, but also the most fun marathon we’ve ever done! And with that, we were done. 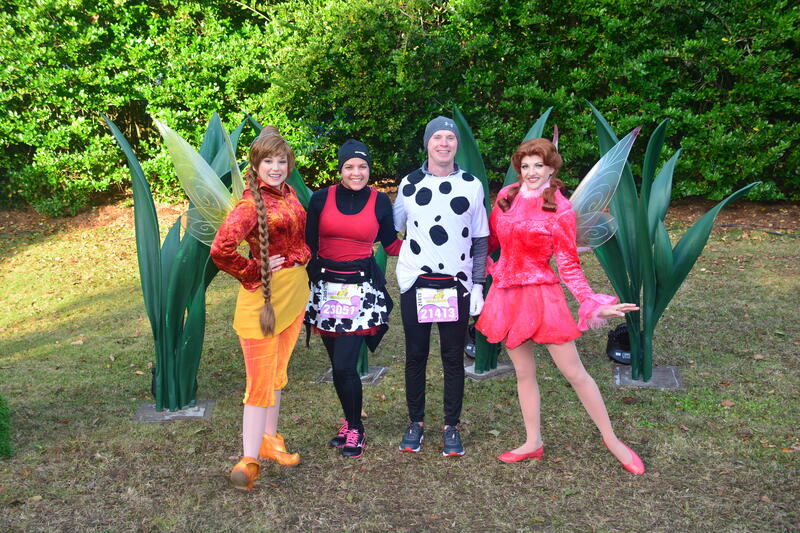 We had completed the Dopey Challenge, 48.6 miles of running in four days. A 5k, a 10k, a half marathon and a full marathon. Unreal. 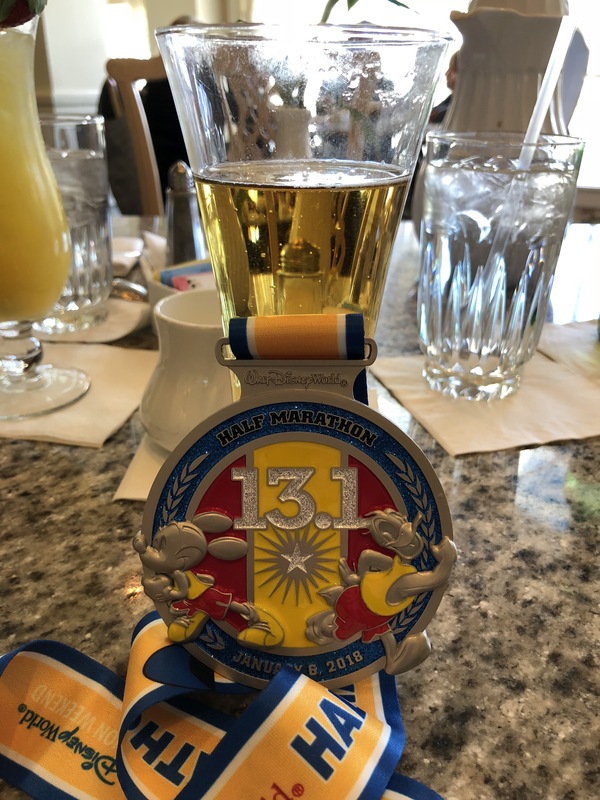 We started celebrating as soon as we got our medals, heading right for the beer tent to wait for our friends to finish. We headed back to our hotel where we cracked a bottle of champagne and put our feet in the cold pool water. Eventually Ro and I showered and hit up Disney Springs, where we munched on some sushi at Morimoto and a few cocktails at Jock Lindsay’s Hangar Bar. We were beat, so we called it an early night to get some sleep. The next morning we hit up Epcot and MK for photos before a dinner at Citricos, and then drove back to our apartment to crash. All in all, it was an amazing experience and we loved every minute of it – except the wake up calls. This isn’t something we would necessarily repeat anytime soon, maybe for anniversary years. 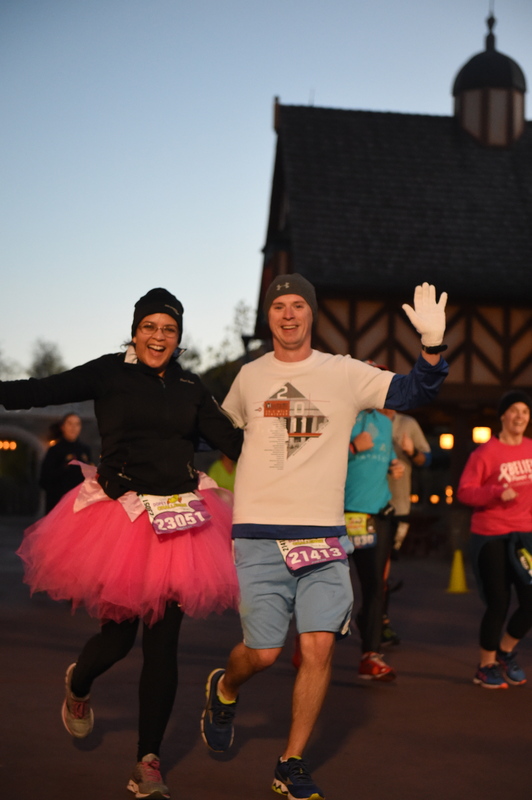 Otherwise, we’ve got Dark Side half marathon coming up next – though we’re searching for another half prior to then. Next up: a recap of our character photos! 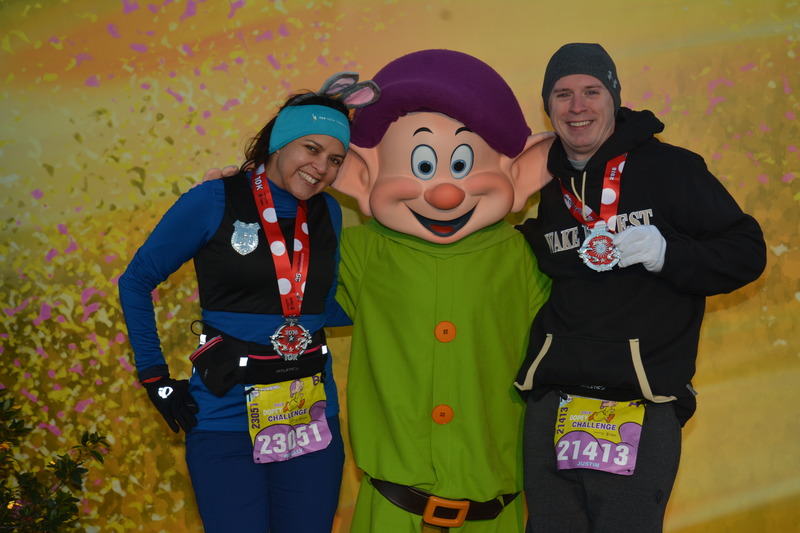 First off, the good news: We successfully finished the Dopey Challenge! 48.6 miles of racing across four (very early) mornings. 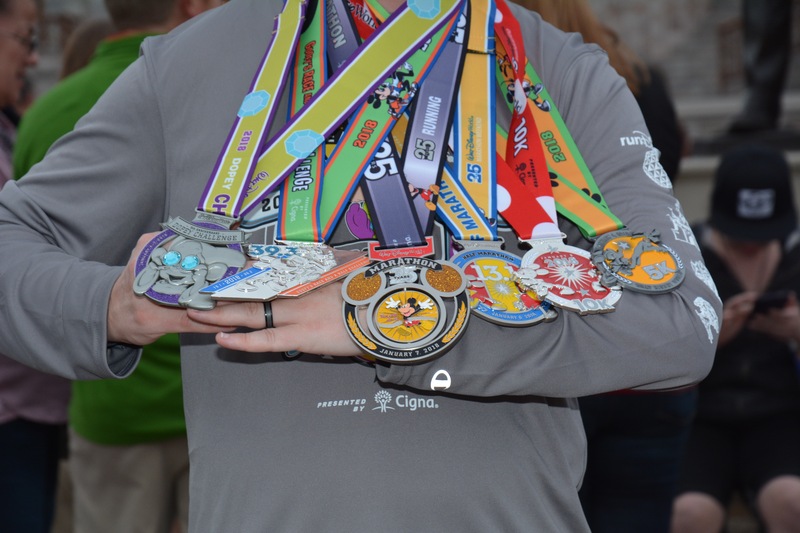 A 5k, a 10k, a half marathon, and a full marathon. I’m still amazed we even signed up for this thing, let alone finished it with flying colors. 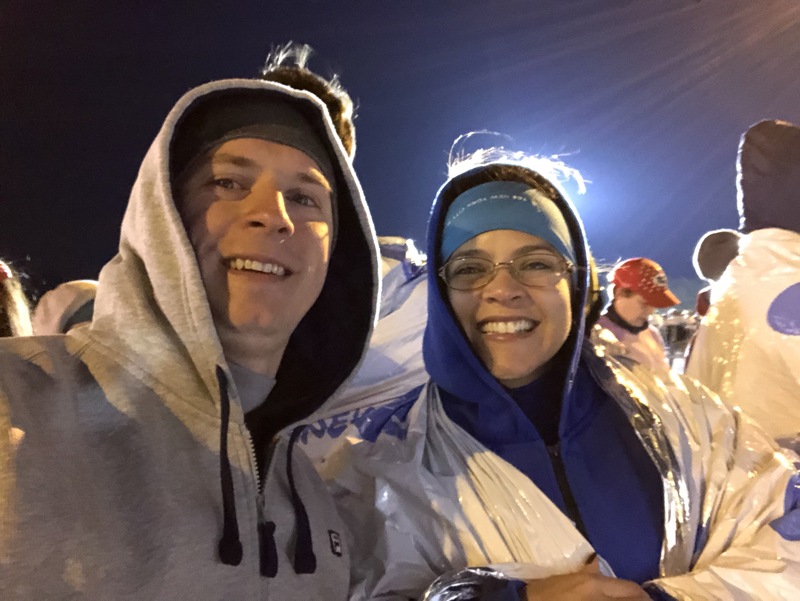 I’ll say at the outset that it was very cold, the morning wake-up calls were horrible, the marathon was very challenging emotionally and physically, and I couldn’t be happier that we got to run it together. It truly was a magical weekend. Before the running began, we had some business to attend to. First up was picking up our packets. 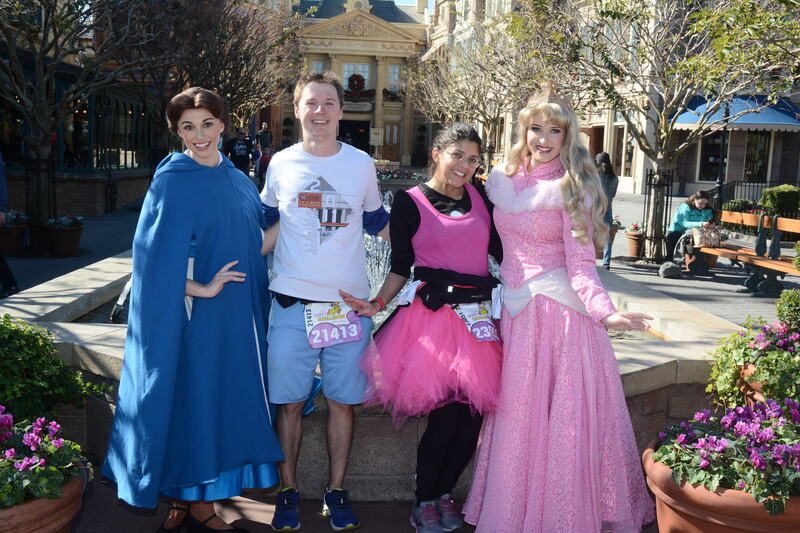 Obviously since we were running Thursday – Sunday, all Dopey participants had to pick up their bibs on Wednesday. This led to a VERY crowded expo with very, very long lines. Bibs and shirts were on the upstairs level of the HP Center at the ESPN Wide World of Sports venue. 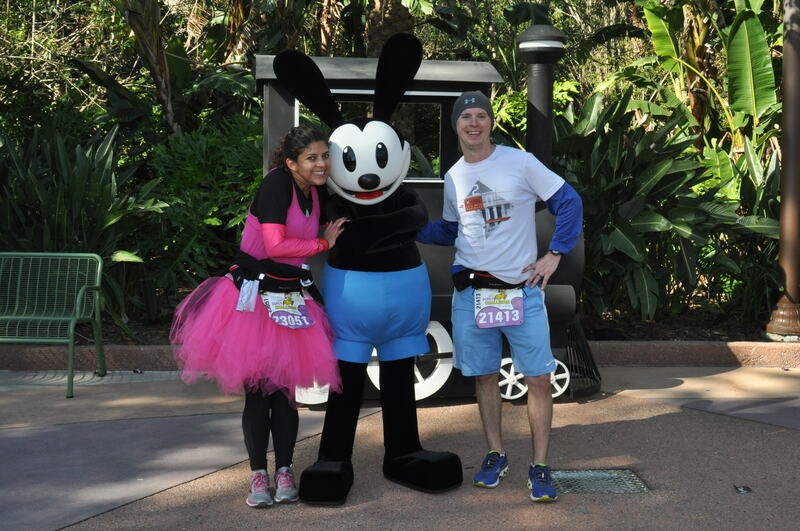 For Dopey, you get two bibs: one for the 5k/10k and one for the half/full (they have the same number, though). 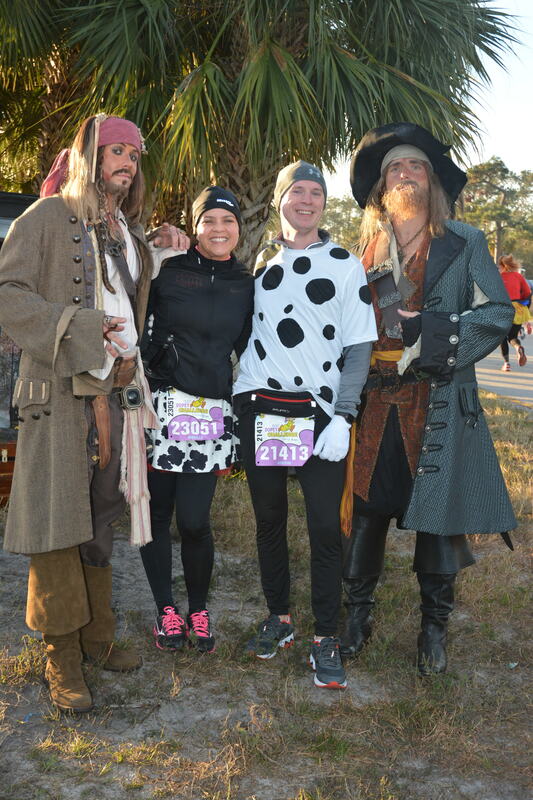 They take your photo so that they can prove you ran with those bibs later on. After that, you pick up your (SIX!) shirts. Downstairs you can visit the runDisney store and pick up any pre-purchased stuff. 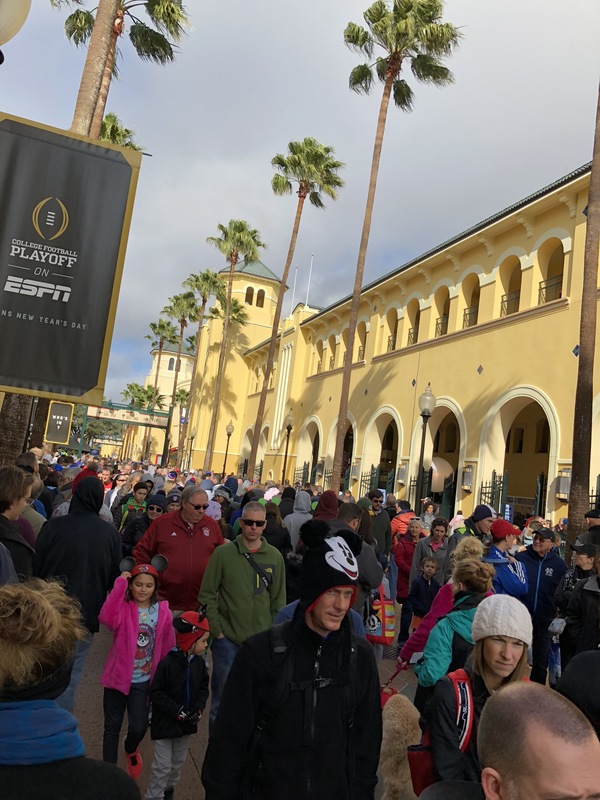 We did a bit of shopping, avoiding the super long line to get into the merchandise area by simply ducking under the ropes separating the pre-purchased portion from the rest of the store. We headed back to the hotel to relax and prepare for the next day. It was friggin’ cold! The temperature was right at freezing, with a slight wind chill dropping it into the high 20s. We drove over from our resort so that we could sit in the car for as long as possible. 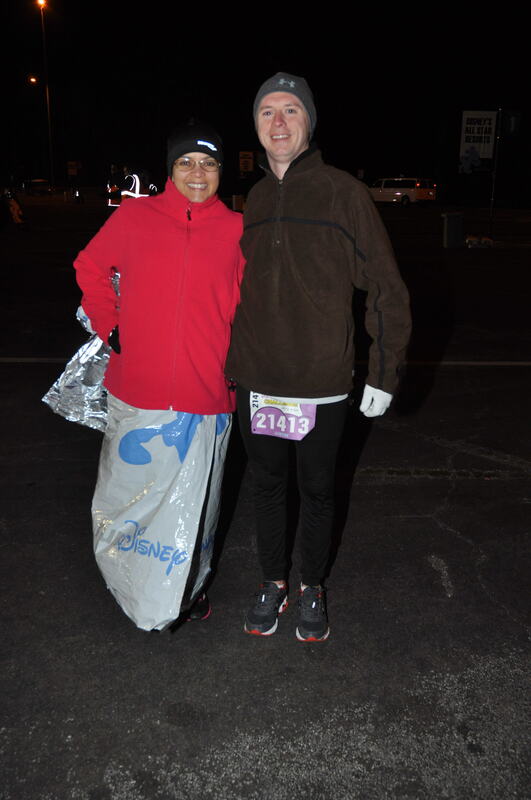 When it was time, we opted not to even bother checking a bag, as we planned to keep our drop clothes on for the entire race. 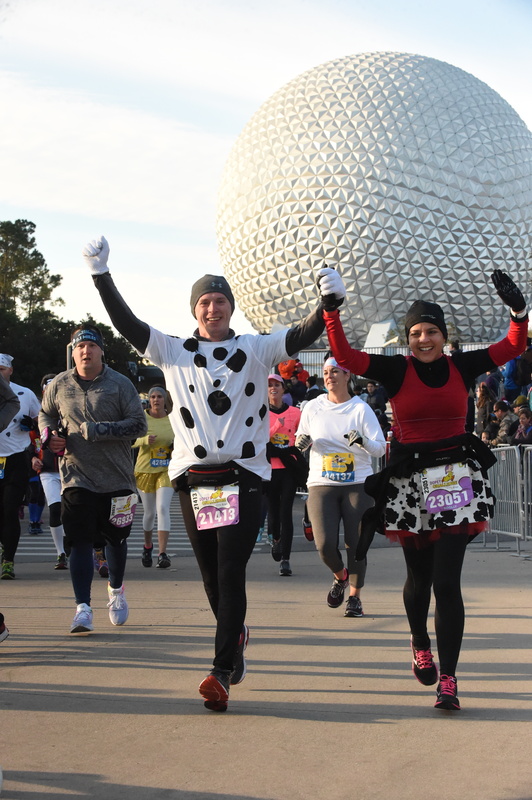 The 5k has a pretty simple course: start in one of the EPCOT parking lots, run through a bit of the backstage area, pop out onto the World Showcase in between Mexico and Norway, and run around to the other side, underneath Spaceship Earth, and finishing back in the parking lot. We opted to skip the first few photo stops, as the lines were a bit long and we were too cold to stop. It was all about forward motion, get back to the car as quickly as possible. We did stop for one character though. Soon enough, we were done. After the race, I actually had to get to work, so I showered and drove to the office for a bit. When I came back, we simply relaxed at our resort, ate a quick dinner, and tried to get to bed early. It didn’t work, but hey, we tried! The course for the 10k was pretty similar to the 5k, just with a longer run around parking lots and other streets before the backstage area. We also ran into and around the boardwalk before going back into EPCOT. 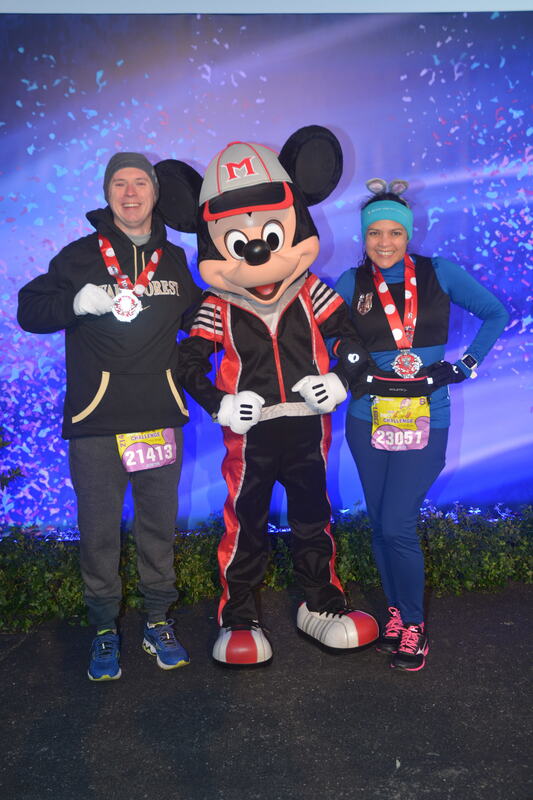 After we finished, we got our second medals of the challenge and decided to take a few photos with some of the finish line characters (AKA the Big Ones: they had Mickey, Minnie, Donald, Pluto, Goofy and Dopey out each morning and immediately post-race) before heading back to the room. And just like that, we were halfway done. Well, halfway in terms of days. In reality we had only ran 9.3 miles, and still had 39.3 to go. The rest of Friday was spent walking around our resort to keep our legs fresh, along with dinner at Mama Melrose at Hollywood Studios. Another early bedtime (in theory) to rest up for the remaining two races.